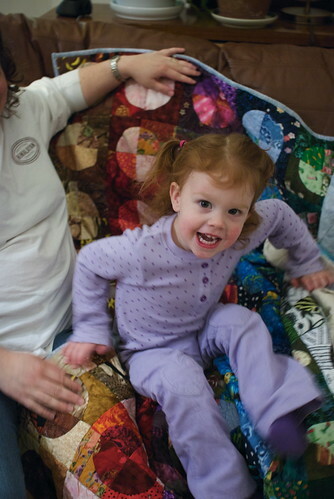 ['This is my RAWR face'] -- Discothèque, the quilt on your left, belongs to Emily, the toddler in the photo. 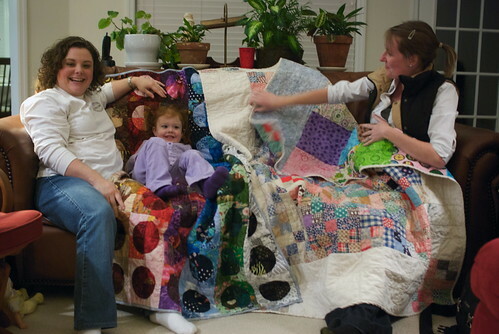 Hallie is holding her quilt 'Continuity,' which is made of squares pieced by either her great-aunt or her great-grandmother. 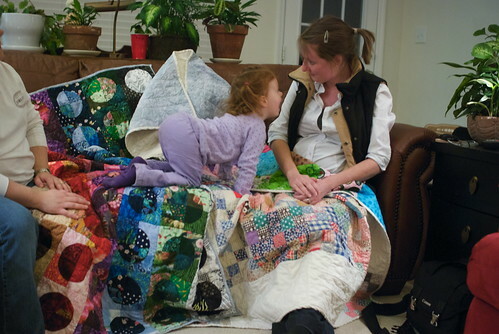 It's worth noting that Hallie and Ashley are old friends, and their quilts share the same backing fabrics. Discothèque's backing is mostly a marbled blue, with a column of Girl Scout fabric; Hallie's quilt 'Continuity' is backed with mostly Girl Scout fabric and a row of the same blue. My day is now officially made. Must ... sew ... faster. Famous Tim is next!